Blue Prism | A Year to Remember! Through it all one thing remains clear—our vision, focus and commitment to the democratization of IT isn’t wavering. Our meteoric rise is tied to our RPA offering becoming the “bedrock” for driving a digital transformation for some of the largest and most successful organizations on the planet. That’s why our accolades just keep piling up. Earlier this month Blue Prism was acknowledged for having the, “Most Innovative Product of the Year” in the enterprise category by the Best in Biz Awards. 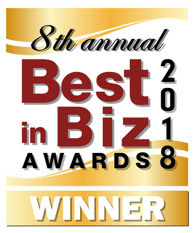 Now in its 8th year, the Best in Biz Awards is the only independent business awards program judged by prominent members of top-tier press, from Associated Press through New York Times to Wired. Criteria for winning this award included highlighting innovations around features, tools, patents, inventions, first-to-market developments etc., tailored and suited to enterprise customers. We are very honored to have been selected by such a well-respected group of judges and proud to be acknowledged with likeminded companies committed to business innovation and disruption. For Blue Prism, it has taken more than a decade of hard work to become “an overnight success”. Continuing to invest responsibly in people, processes and systems (opening several new office locations in France, Germany, Singapore and Hong Kong to name a few). That’s why we remain so bullish and optimistic about 2019. We have the world’s most successful and advanced Digital Workforce that complements human talent and helps organizations automate and scale business processes via AI, machine learning and intelligent automation.We’re continuing to experience hyper-growth while investing heavily in R&D and new market opportunities. This is what gives us the confidence for our outlook in 2019. As Blue Prism’s Chief Evangelist, I can’t wait to see what the next year has in store for us. I will be blogging more regularly, so stay tuned for more thoughts and insights from @evangelistblue.